My Homemade Vanilla Macadamia Nut Milk is such a delicious and easy dairy-free option to make at home. My recipe is lightly sweetened with dates, plus vanilla for extra flavor. Macadamia nut milk doesn’t require straining which means it can be made in about 30 seconds in a high-speed blender like a Blendtec or a Vitamix. The ingredients are simply mac nuts, water, vanilla extract, and dates. 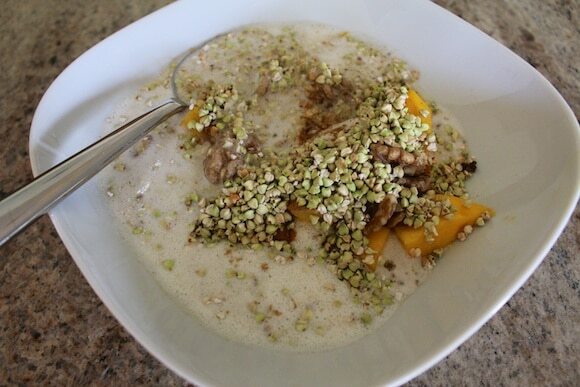 This is an easy and delicious dairy-free nut milk recipe. Combine ingredients in a high-speed blender and process until smooth, about 45 seconds. Keep refrigerated in an air-tight container and use within 3-5 days. Stir before using. This is Vanilla Macadamia Nut Milk recipe is a winner! It will separate upon standing, though, so you just need to give it a little stir before serving. It will keep up to 3-5 days in the fridge. I also made Alan a dessert smoothie with it using frozen peaches and it works wonderfully in hot beverages, too. 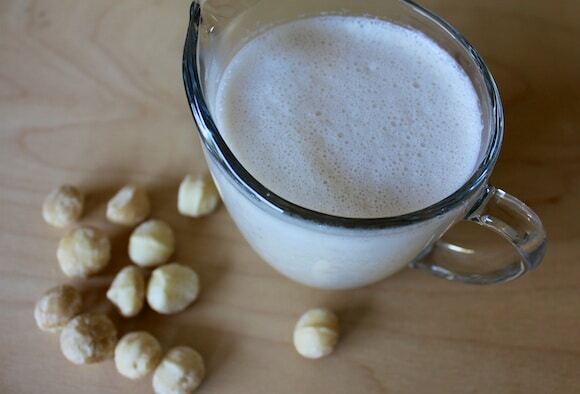 Pin this Vanilla Macadamia Nut Milk recipe to your favorite Pinterest board if you like it! READ NEXT: WOULD YOUR HEALTH BENEFIT FROM GOING DAIRY-FREE? How do you think the mac milk would be without the vanilla and dates? Have you tried it that way? I only ask because I’m experimenting with different nut, grain, and seed milks and prefer less sweet (if at all!). Hi Karen! Great question. Well, I haven’t tried the mac nut milk without the dates. I think considering how delicious the nuts are, though, that it would be great without the sweetness. Please do let me know if you try it. Perfect timing! I will for sure try this out — seems so quick and simple. Just yesterday I noticed, unexpectedly, that I was out of any sort of milk except a small 1 cup box of rice milk at the very back of the pantry — which was so out of sight that it was going to be there until well past the expiration date! Well, I found that disguarded gem and was able to complete the recipe that I was working with (Fuhrman’s Pineapple Cake — YUM! ), but I would have liked a milk with a little more substance. The icing, though good, was a little runny because the rice milk was so thin. I always have a wide variety of nuts on hand, so this recipe will definitely be a handy one for me. Ha ha, that’s a great story, Diane. I’m glad to hear your cake turned out okay…phew!!! 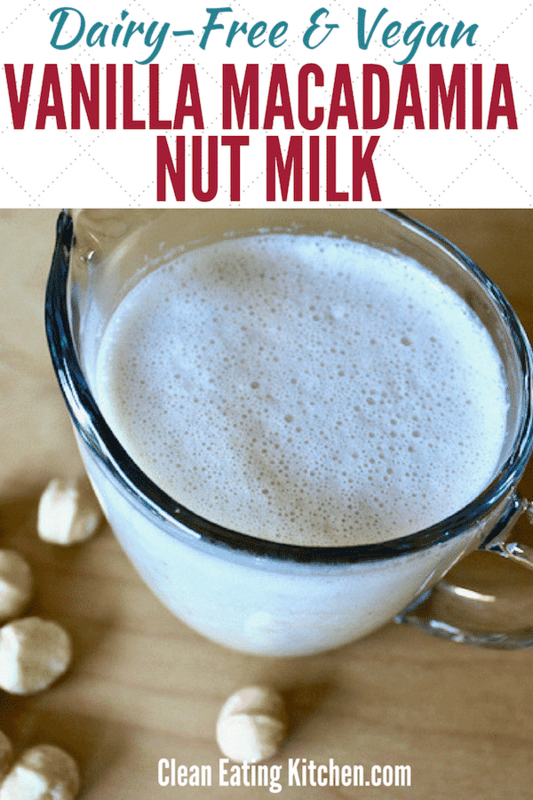 🙂 Yes, you should definitely try making your own nut milk, it’s soooo easy! What a great idea this is. I’m a new vegan so discovering all this is so much fun. I had a food blog for several years but now have a vegan blog and I’m loving this! I have scraps of paper everywhere too! Mmmm yummy – sounds great! I love that you don’t have to strain it. I’m surprised that making nut milk is so easy! Maybe I’ll give it a try next time I run out of almond milk! Never tried macadamia milk, but it sounds amazing. I prefer milks that do not need straining and have been making a lot of hemp milk. 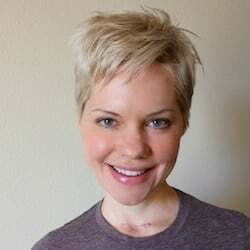 And very interesting on BlogHer, I’ve been thinking about them too. I keep trying to make plant milks for my son and he always prefers the store bought ones (unsweetened soy and oat) — but he loved this one. Thanks!!! 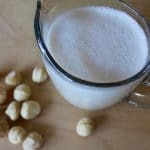 I love making nut milks but have never tried macadamia. Guess what’s going on the shopping list right now! Would you come share this at Raw Foods Thursdays? And I echo your sentiments about the online community. I am so thankful for my blogger and reader friends!! They truly enrich my life. Thanks so much for linking up! Sharing this on Facebook and Pinterest now! Can’t wait to try it. 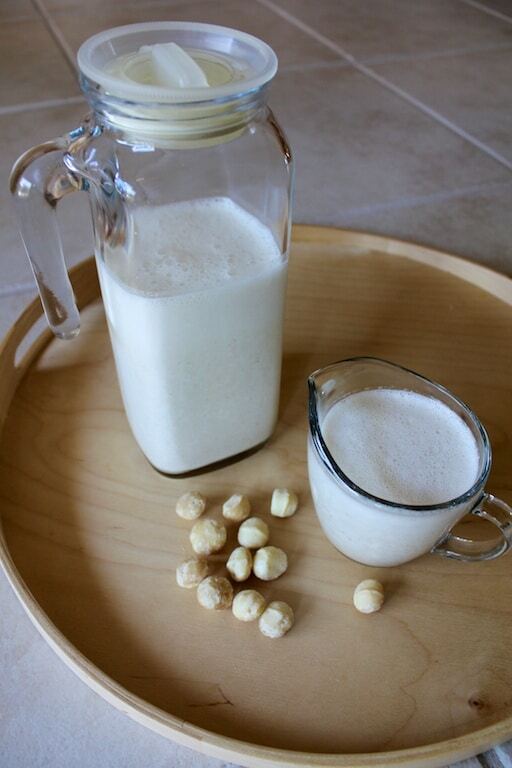 Thanks for sharing this macadamia nut milk recipe! I made it and have been using it in my smoothies this week. I love that you don’t have to strain it and I also love how much cheaper it is to make than almond milk! Oh, I miss macadamia nuts! I haven’t had one in over 2 years! WIth the nut allergy in our house we certainly make changes. This looks amazing and I am living through you for the taste! YUMMMO Got it pinned and tweeted. Thanks for linking up at Gluten Free Fridays! Hi just wondering what do you consider a serving? 1 cup? Recipe sounds great just wasn’t sure about that one thing (considering how much to buy to make it last) thanks! Hi Katerina! Yes, I would estimate about one cup per serving, just a rough estimate. What are you going to use it for? I have never heard of Macadamia nut milk before but why not since cashew nut is become very popular recently. Sounds like a unique and flavorful alternative to other milks and conventional milk that would give a twist of flavor to tantalize the taste buds. Thanks for sharing on Real Food Fridays. Pinned & tweeted! When vanilla, macadamia and dates meet….yummy recipe! Hi, I was wondering why use dates for sweetener instead of sugar? What is the amount of sugar to use if I don’t have dates on hand? Dates are a whole food and provide fiber and minerals. You could use a tablespoon of maple syrup as an alternative.